EDINBURG, TEXAS – DEC. 4, 2015 – A new Memorandum of Understanding signed Dec. 3 between The University of Texas Rio Grande Valley and the Universidad Autónoma de Tamaulipas, the state university of Tamaulipas, Mexico, will provide new collaborative opportunities to students, faculty and staff at both border institutions. 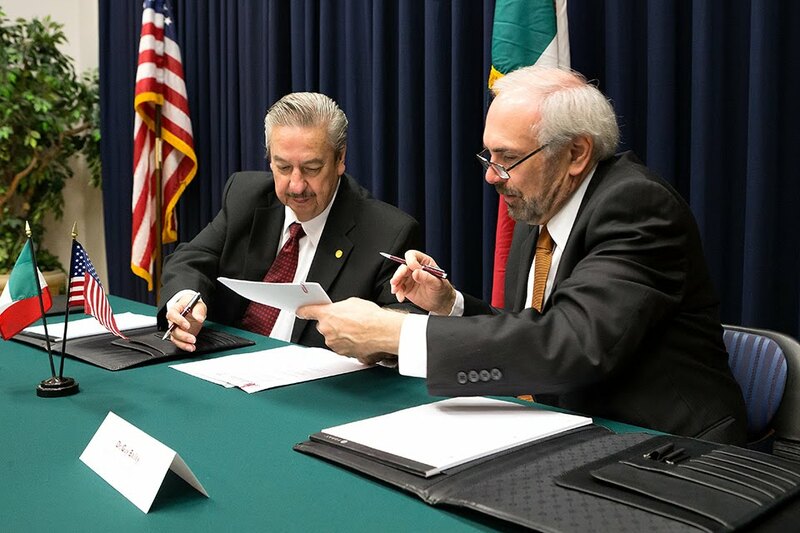 The MOU, signed by UTRGV President Guy Bailey and Universidad Autónoma de Tamaulipas Rector C. P. Enrique C. Etienne Pérez del Río, provides for cooperative efforts to promote academic interchange of faculty and students, joint research projects, exchange of academic publications, reports and other information, and collaborative professional development, among other activities as approved by both institutions. Bailey said the signing formally continues a relationship that has been in place for more than 25 years. Pérez del Río, who became his university’s rector in 2014, said he aims to lead his university from being “good” to “excellent,” and to produce graduates who not only are qualified, but also have strong values. The academic heads of both universities – Provost and Executive Vice President for Academic Affairs Dr. Havidán Rodríguez and UAT’s Secretario Académico Dr. Marco Aurelio Navarro Leal – also spoke at the ceremony. Navarro Leal said the border relationships that already exist in terms of families, the economy and growth already make this a strong region, and that there will be growing opportunities for students to fill needed positions in areas like technology and the space industry. Research will be important in medical technology, he said, and in meeting the countries’ common challenges of maintaining clean air and water. “We need to start working together in terms of how we are going to prepare our students to face these new challenges,” he said. The Universidad Autónoma de Tamaulipas, based in Cd. Victoria, Tamps., has the highest enrollment in the state of Tamaulipas, serving about 40,000 students in 26 academic units, colleges and schools located in Reynosa, Matamoros, Nuevo Laredo, Tampico, Cd. Mante and Valle Hermoso. In addition to a medical school, it also has research and knowledge transfer centers. 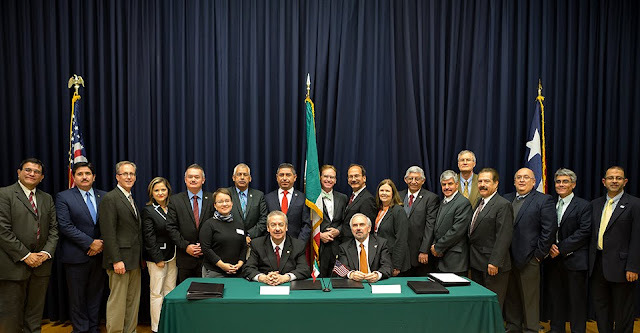 The UTRGV Office of Global Engagement hosted the MOU ceremony, which was attended by deans and academic leaders from both institutions. The OGE oversees International Programs and Partnerships, International Admissions and Student Services and the Language Institute. Dr. Dennis Hart, UTRGV associate provost of the OGE, said UTRGV is looking for strategic partnerships.